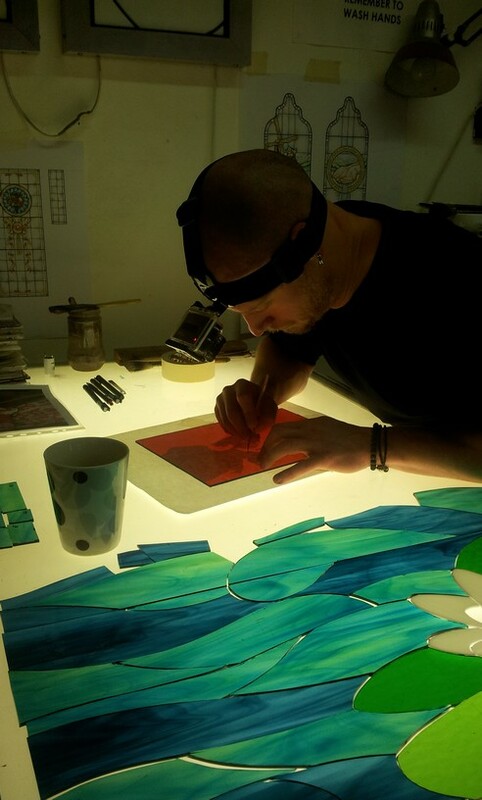 Lancashire based stained glass studio Lightworks begin work with creative film-maker Patrick Walsh. Having been introduced by the film-makers father, a friend of stained glass artist and company director Daniel Burke, Patrick Walsh contacted Lightworks Stained Glass, based in Clitheroe, and expressed his great interest in capturing the essence and workings of a 21st century stained glass studio. This he explained would then contribute to his ongoing work in recording a series of films about varying different modern day exponents of traditional crafts. Lightworks of course jumped at the opportunity. Following an initial meeting during which Patrick was provided with both an introduction to the craft, with its broad range of distinct practical skills, and the environment in which filming would be focused; Lightworks compact and busy studio, the two then considered the best way to proceed with the project? Having looked carefully into the companies upcoming schedule of works and considered the practicalities of capturing a creative process that can, for larger projects, take in excess of 12 months to complete, it was decided to concentrate filming on two separate projects. The first of these would be a small scale comparatively simple piece which the company would be able to complete from start to finish in no longer than a month. This would allow Patrick to become fully familiar with his subject and relatively quickly produce a short film of between 60 and 120 seconds. The second would be a far more challenging proposition for both; capturing the entire creative process of a large scale, highly complex commission, potentially spanning up to twelve months to complete. “Film One” will capture the production of a small panel of stained glass and feature Lightworks artists undertaking all practical aspects of the craft including glass painting and kiln firing. Contributing to the firm’s transatlantic collaboration with US based Matthew Alderman Studios, the finished piece will feature a section of Matthews illustration entitled “Sancta Lucia” (St. Lucy). “Film Two” will follow the company and its craftsmen as theyembark on one of their largest and most technically challenging commissions to date; the design production and installation of a new, large scale, bespoke stained glass window featuring Neptune, The God of the Sea. The image shows Daniel beginning work on the small St. Lucy project fitted with a full HD Head-Cam.